Western blot analysis of whole cell lysates probed with CD324 antibody followed by detection with HRP conjugated Goat anti Mouse IgG (1/10,000, STAR207P) and visualized on the ChemiDoc™ MP with 6 second exposure. Arrow points to CD324 (molecular weight 120 kDa). Mouse anti-human CD324 antibody recognizes cadherin-1, also known as CAM 120/80, E-cadherin, cell-CAM 120/80, epithelial cadherin or uvomorulin. This antibody has been extensively validated for western blotting using whole cell lysates. Mouse anti Human CD324 antibody recognizes CD324, also known as cadherin-1, CAM 120/80, E-cadherin, epithelial cadherin or uvomorulin. The CDH1 gene is a classical cadherin from the cadherin superfamily. The encoded protein is a calcium dependent cell-cell adhesion glycoprotein comprised of five extracellular cadherin repeats, a transmembrane region and a highly conserved cytoplasmic tail. Mutations in CDH1 gene are correlated with gastric, breast, colorectal, thyroid and ovarian cancer. Loss of function is thought to contribute to progression in cancer by increasing proliferation, invasion, and/or metastasis. The ectodomain of this protein mediates bacterial adhesion to mammalian cells and the cytoplasmic domain is required for internalization. Identified transcript variants arise from mutation at consensus splice sites (provided by RefSeq, Jul 2008). 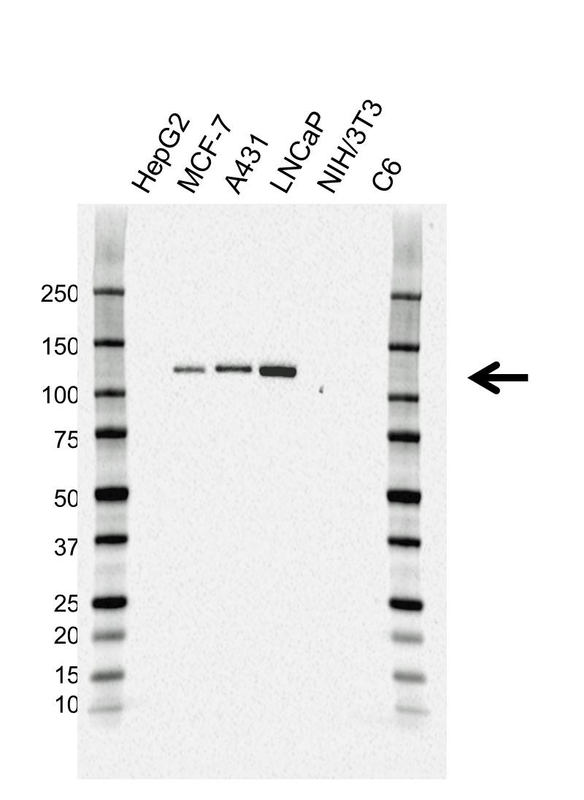 Mouse anti Human CD324 antibody detects a band of 120 kDa. The antibody has been extensively validated for western blotting using whole cell lysates.